Here at Food Processing, we understand how stressful life can be, so we're encouraging you to take 5 minutes to add a little fun into your life. 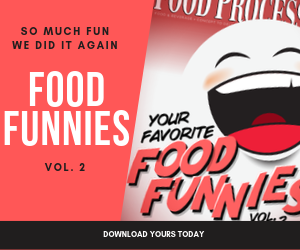 Food Funnies is our way of letting you take a break from all the serious stuff you deal with at work — by coming up with appropriate light-hearted captions. Here's how it works: Submit your caption, via email, for the cartoon that appears below. When we've collected enough captions, they will be put to a vote by you, our faithful readers. The winning captions will be featured on the FoodProcessing.com Web site and in an upcoming FoodProcessing.com eNewsletter. Harvest a few good laughs by coming up with a caption for our October cartoon.